While more of a project that other offensive tackles in this class, Levon Myers looks last a mid round candidate if the Seattle Seahawks draft an offensive tackle early on Day 3. Aside from having an awesome last name, Levon Myers has the attitude and work ethic to succeed at the next level. Physically, Myers looks the part. He’s got long arms, broad shoulders and strong core. This is a kid who was born to be an NFL offensive lineman. Myers also has surprisingly polished technique. His footwork keeps him balanced, and he displays proper knee bend. Myers also doesn’t get caught leaning and belly-bending. Unfortunately, not all of that translates to the NFL. His footwork technique is solid, but slow. He uses his core strength to anchor against the bull rush, but he doesn’t generate downfield push in the running game. Myers might not get much push, but he also doesn’t ever get blown up up in the run game either. He will wall off this defender, and keep them from pursuing the ball carrier. It is almost as if Myers was mis-cast as an offensive lineman. As a 2-gap NT in a standard 3-4 defense, he might have been a very good run defender. 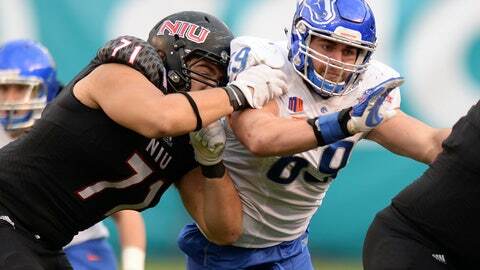 If there was ever a player to pull an inverse-cable (move from OL to DT) it would be Levon Myers from NIU. He’d be an interesting 2-gap NT. Myers seem unsure and overly-cautious when asked to block in space. His coaches were not afraid to have him pull or move up to the 2nd level, but there seemed to always be a moment of hesitation before he would engage with the linebacker. Myers was a left tackle in college, but he won’t stay there. If he can stick at OT, it’ll be on the right side. More likely though, his future is inside at guard. Even then, his inability to get straight ahead push will limit his scheme fit. Watching his tape, it would appear that there is plenty of room for growth here. His feet will never become faster, but a good coach should be able to turn his strength into actual power in the run game. Levon Myers has to be viewed as a protect offensive lineman. He won’t come into training camp ready to play. With time, he should turn into a blue collar run blocker for a team with a bit of patience.